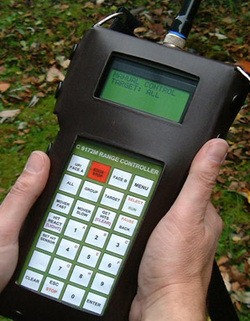 1) a manual controller of individual or groups of target bases. 2) a simple timer with the facility to program and run Face/Edge/Repeat sequences. 3) a controller that allows shoot programs configured on a PC, using the Militec PC Shoot or MOUT Trainer software, to operate target bases independently or in groups, with different time exposures and hit reactions. 500 grams, including batteries and leather case. 4 x 7 membrane keypad. 4 Line x 16 characters with contrast control. 4 No. 1.2V NiMH batteries, recharged via the charge socket. 8 separate channels with 50KHz spacing. Target identification address number and/or radio channel can be changed from the handset. Face/ Edge timing 1 to 999 secs. Sequence repeat 1 to 999 times. PC Shoot or MOUT Trainer software. Program length, 1000 seconds not including pauses. Operational distance up to 1000 metres depending on terrain. Displays hit results for each target together with the time taken for the first bullet to hit the target after exposure. Individual hit sensor sensitivity adjustment. Targets can be switched off remotely. a). Bounce Back, target turns away after 1 - 9 hits and return to face after 1 sec. b). Turn When Hit, target turns away when hit 1 - 9 times and stays away. c). Hold target will not react to hits.